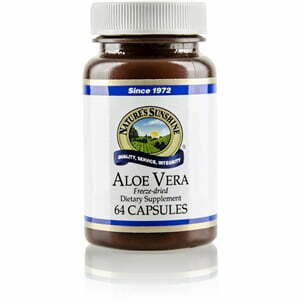 Nature’s Sunshine Aloe Vera supplies essential vitamins and nutrients to the body, particularly the intestinal system. Aloe Vera contains vitamins B1, B2, B6, C, niacinamide, choline, and 18 amino acids. Over-processing of aloe vera decreases the herb’s nutritional benefits. While some manufactures claim that their aloe vera has an agreeable taste, such aloe vera formulas contain only 10 to 15 percent aloe vera. 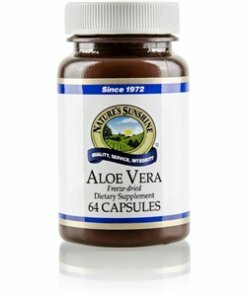 Nature’s Sunshine keeps essential nutrients through special processing, and each capsule is made of 100% pure aloe vera liquid. Sodium benzoate is added as a safe preservative. Cellulose, gelatin, glycerin, and water.